A105、A350 LF2、A182 F11、A182 F22、A182 F304、A182 F316、A182 F51、B150 C61900、B564 N04400、B546 N06625,etc. Matetial:Carbon,stainless steel ,Alloy steel and other material. 7. 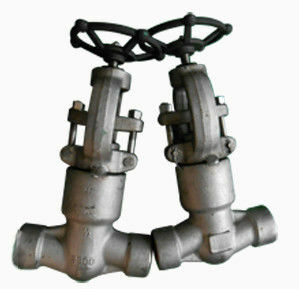 Forged Steel Gate Valves conform to API 602, BS5352 and ASME B 16.34. Each valve is inspected and tested in accordance with API 598, and marked per MSS SP25. Pressure Seal Bonnet Globe valve materials include: A105/ A 216 WCB/WCC carbon steel, A182F11/WC6, A182F22 / WC9, A182 F316/CF8M, Duplex / Super Duplex. Pressure Seal Bonnet Globe valves can also be fitted with Gear Operators; Actuation, both Electrical & Pneumatic. Non-destructive testing , Magnetic Particle Inspection, Positive Material Identification, Radiography & Dye-Penetrant). No job is too small or too large, whether it is one valve, small project and shut down requirements or stock replenishment we can fulfil the contract. Keywords: PSB GLOBE VALVE, SIZE: 1/2 INCH DIAMETER, RATING 2500, TYPE SW, MATERIAL ASTM A182 Gr. F304/304SS, TRIM 304SS. Material: BODY ASTM A182 Gr. F304/304SS, TRIM 304SS. Material Main material: A105,A350 LF2,A182 F11,A182 F22,A182 F304,A182 F316,A182 F51,B150 C61900,B564 N04400,B546 N06625, etc. Other remarks 1 The sealing faces of valve seat and valve clack are build-up welded with hard alloy to improve the erosion resistance and extend the service life of valve. Other remarks 2 The friction between sealing faces is smaller during opening and closing, facilitating a longer service life. Other remarks 3 The valve clack is of taper, needle, ball and parabola types, and can be used to adjust the flow rate. Other remarks 4 SS+ graphite or metallic seal is adopted between valve body and bonnet for reliable sealing. Other remarks 6 The valve stem thread will not come into contact with the medium, so the corrosion of medium to the thread is reduced. Other remarks 7 A certain clearance is provided between valve clack and valve stem. You may adjust it by yourself. The sealing is reliable. Other remarks 8 Short stroke is suitable for application at positions subject to frequent opening.